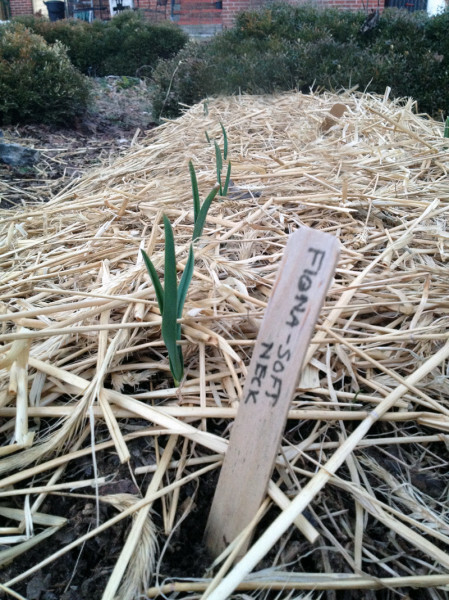 Home Garden Smarts Blog Garlic Is Up – Is Spring Here At Last? Garlic Is Up – Is Spring Here At Last? Yesterday it finally felt like spring though there is snow in the forecast for Tuesday. This has been the toughest winter here in the northern Shenandoah Valley for at least 20 years, and it seems like it is not over yet. We just can’t shake the shivers! But we did finally got a chance to sit out on the back porch yesterday in the warm sun and thin the trays of seedlings that had been languishing in the sun room window. The hardy stuff (lettuces, broccoli, rainbow chard and some Early Jersey Wakefield cabbage) even got to sit out overnight. While we were thinning the flats with tiny scissors (always cut off extra seedlings instead of pulling them out, which disturbs the roots of those that remain) I glanced out over the garden and noticed a hint of green poking up through the straw in one of the back beds. Even though I am just off crutches (had a bad fall back in January that has kept me from posting as much as I’d like) I had to go investigate. On closer examination, it turned out that the garlic we bought from Slaynt Vie Farm at the Charles Town Farmers Market last fall had started to poke through the mulch. At last!